For two glorious hours, a select group of Idyllwild Arts students brought music back to the Palm Springs High School. The “Classics in the Schools” event held on Nov.2 was made possible by the Steinway Society of Riverside County, a classical music outreach program that now involves more than 60,000 students, by providing piano instruction, keyboard loans and live performances like this one. The “Classics in the Schools” was a half-day of entertainment for these middle and high school students, whose music funding has been drastically cut. It also was an opportunity for the Idyllwild Arts Academy to promote itself. “We’re always looking for more students,” said Dr. Nelms McKelvain, from the Idyllwild Arts Music Department, who chaperoned the event. In the audience, was Stan Walden, who was invited to the first show by Ruth. He wrote the music and lyrics of the 1969 Broadway show, “Oh! Calcutta!” Ruth had wanted Stan to see the Idyllwild Arts students perform because he puts on variety shows like this one all over the world, she said. The 13 Idyllwild Arts students who performed included: Manjie, Anni, Savannah, Juwan, Bohan, Timmy, Ashi, Alejandro, Ariann, Adrianna, Geneva, Jake and Lake. 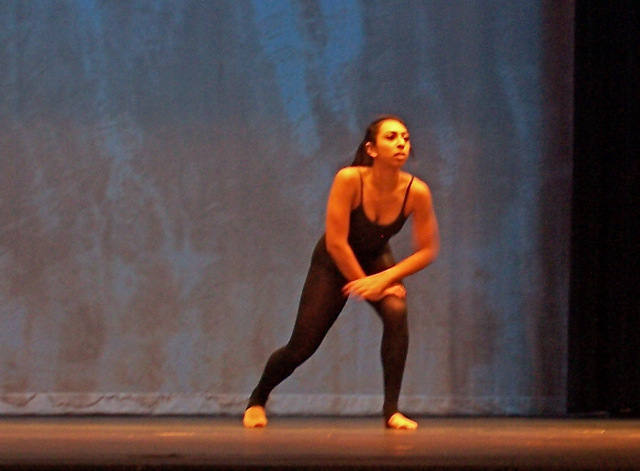 They were from the Jazz, Classical Music, Theater and Dance Departments. Each decided on their own songs, dances and monologues. Although the students didn’t know Stan was there at the 11 o’clock show, he was impressed with their performance nonetheless. 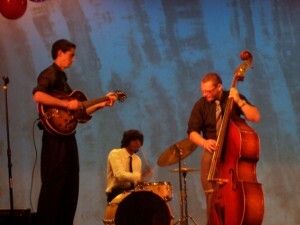 He liked the songs that the jazz combo made up of Alejandro, Ashi and Lake, were playing. “That song is called ‘Round Midnight,'” Stan said, as he listened closely to it, sometimes closing his eyes. Although the middle and high school students in the audience were listening politely, some of them were fidgeting. He was right. Next up was Geneva, who performed a dance that she had also performed at the Spotlight Award preliminaries the week before. “You go, girl!” one female student shouted from the audience. After Geneva, dancers Ariann and Adrianna also performed their Spotlight audition dances. “I wish I could have performed for Spotlight like I did today,” Ariann said later. Stan said that Adrianna’s dance was especially good because she also used the middle of her body. 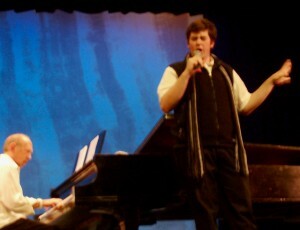 Next, came Jake, a musical theater student, who sang a funny song with Nelms and Anni at the piano. After Jake’s rousing performance, Juwan, a theater student, slowed the tempo a bit. He came out and sat on a stool, and sounded like he was talking directly to the audience. In fact, it was an over-the-top monologue from a murderer who was going to the electric chair. The audience reacted with cheers and laughter. Juwan was following his lines, but changed them for the one o’clock show. 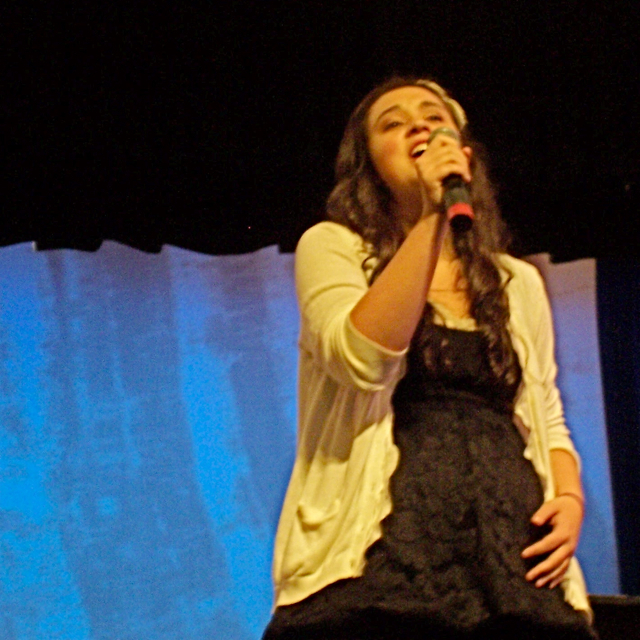 Savannah sang a love song that wowed the audience. Like Juwan, she had to “wing it” for the show. Instead of a script, hers was a wardrobe malfunction. Nelms had asked all of the students to wear black and white for the show. “It looks classy,” he said. When the classical pianists Bohan and Timmy played, some of the handicapped students in the audience were transfixed and transformed. A boy in a wheelchair had sat during most of the show with his head down, looking at his lap. Yet, when Bohan and Timmy played classical songs on the piano, he lifted his head towards the stage and smiled. “You never know what kinds of music will reach them,” Stan had predicted. Stan was also impressed with Timmy’s confident performance. Two years ago, Timmy had won first place in the classical music category at the Spotlight Music Awards. 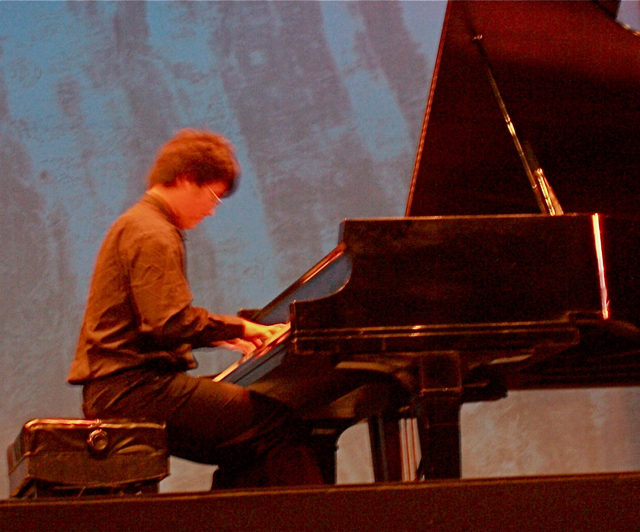 After his performance at the Dorothy Chandler Pavillion, he received a $5,000 dollar scholarship. The final two performers performed together, Anni on piano, and Manjie on violin. 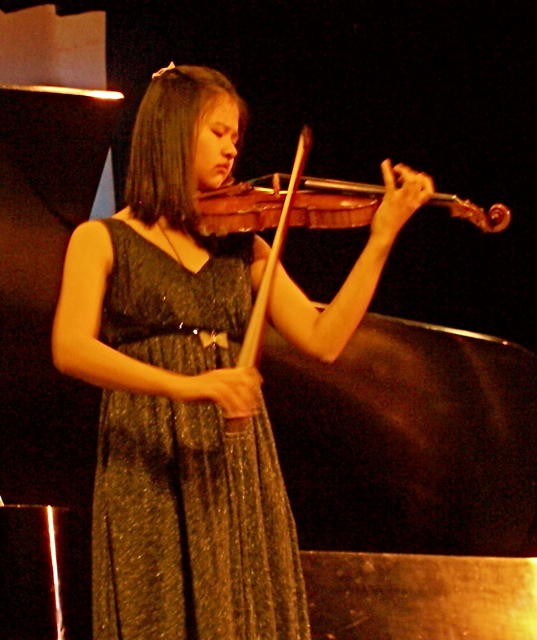 This was 14-year-old Manjie’s first public performance in the schools. She and Anni said they weren’t nervous, because they knew the music. Manjie had practiced it many times in her native China. Her mother even has it on video on her laptop computer. Afterwards, Ruth Moir invited the Idyllwild Arts students to come out for one last bow and asked them to recite their names and country or city of origin. The 13 performers came from China, Mexico and various U.S. cities. 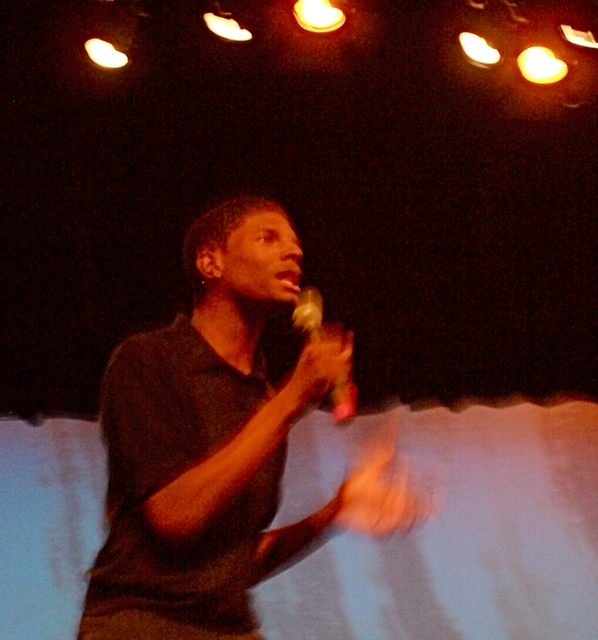 Before the last set, Juwan had invited the students in the audience to visit the campus or look on the academy’s web site, www.idyllwildarts.org. For their part, the Palm Springs middle and high school students cheered, clapped, and took pictures, yet were reluctant to leave. The first two arrivals said that the seniors had decorated the auditorium with hundreds of pink, purple white and black balloons. As they left. some of the students grabbed them as mementos. “We’ll be back next year,” Ruth promised the audience. Satisfied, Stan stood and congratulated Nelms and Ruth backstage. Copyright 2010 Idyllwild Me. All rights reserved..